When friends weren’t able to travel to Piedmont this past fall, they did the next best thing and brought Piedmont to their home. 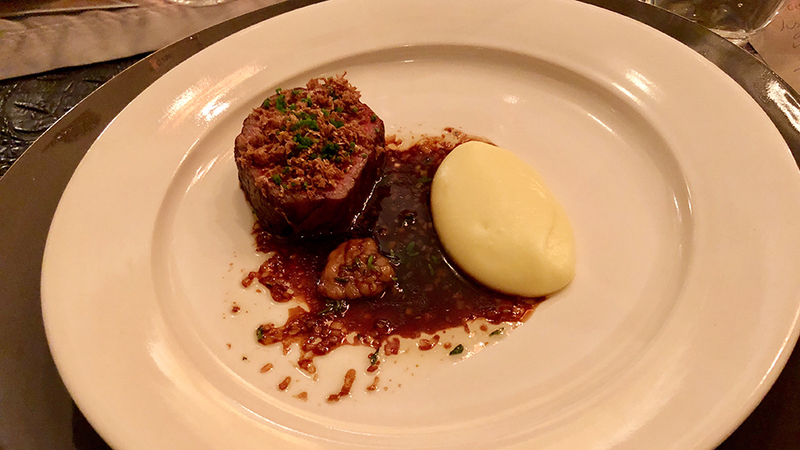 This intimate dinner featured a lovingly chosen selection of Piedmontese classics, paired with a fabulous menu and an ungodly amount of white truffles. What could possibly be better? I first met David Nayfeld when he was a sous-chef at Eleven Madison Park years ago. Nayfeld’s resume includes stints at the now-closed Cru in New York City and Joël Robuchon in Las Vegas. Nayfeld was joined in the kitchen by Angela Pinkerton, who was formerly the Executive Pastry Chef at Eleven Madison Park. 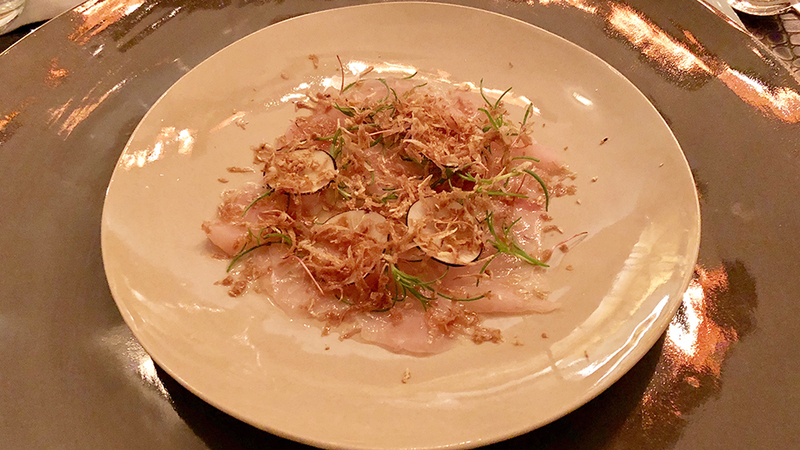 It was a real thrill to indulge in this dinner, as I doubt Nayfeld and Pinkerton will have the time to cook in private homes once their new restaurant, Che Fico, opens in San Francisco this spring. The menu was absolutely brilliant. Nayfeld served white truffles grated on some dishes, like the crudo and beef main course, but chose the more conventional shavings for his velouté and the ravioli. The potato purée that accompanied the Wagyu beef was a recreation of the classic Robuchon preparation of equal parts potato and butter. Yes, I went to the gym the next day...White truffles and ice cream worked beautifully. Pinkerton’s rendition was absolutely delicious. I had seconds, as did everyone else. It’s a pretty special dinner when Selosse and Krug Champagnes aren’t the main event. On this night, our attention was focused on a number of super-rare Barolos and Barbarescos. Our host put together four carefully thought-out pairs of wines that were a real pleasure to drink side by side. A flight of 1960s Giuseppe Mascarello Barolos was a last minute addition. Allow me to make a suggestion. If you invite me to your house, don’t let me into the cellar. 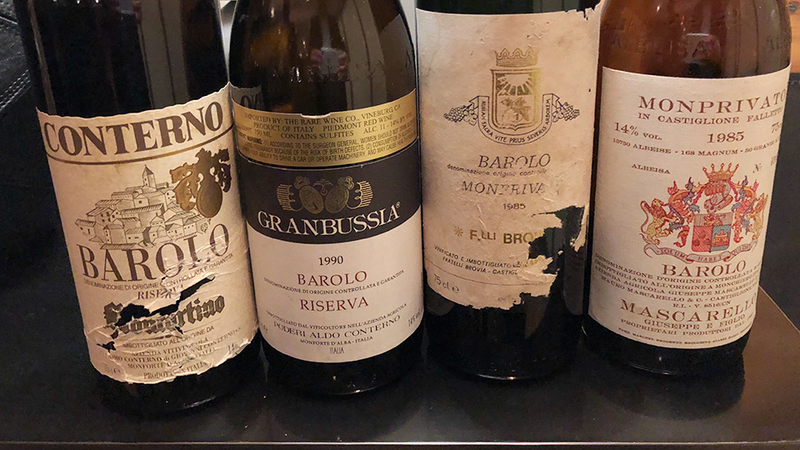 My eyes lit up as soon as I saw a selection of 1960s Mascarello Barolos, precious wines from a long-gone era in Piedmont’s history. Our host must have noticed my reaction, because a few minutes later we were on our way upstairs with those bottles in our hands. Crudo and Barolo, especially with a little bottle age, go surprisingly well together. This is an inspired pairing. 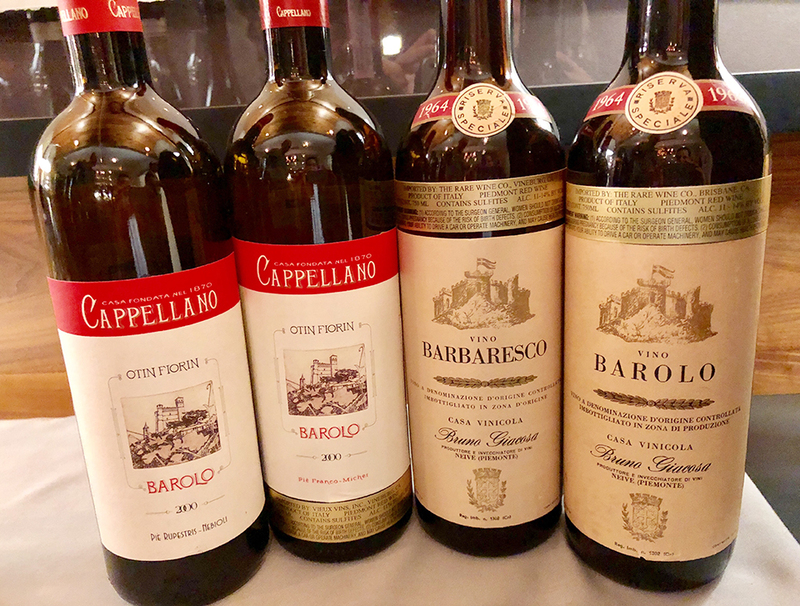 In 2000, the two Cappellano Barolos aren’t as differentiated as they often are. Not that it matters that much, as both wines are gorgeous, and the opportunity to drink them together doesn’t exactly come along every day. The 2000 Barolo Otin Fiorin Piè Rupestris is dense, powerful and very young. There is so much explosive energy here. Firm tannins buffer the natural intensity and ripeness in this striking, drop-dead gorgeous Barolo from Cappellano. A silkier, more refined expression of Nebbiolo emerges from the 2000 Barolo Otin Fiorin Piè Franco. With its lifted aromatics, mid-weight structure and impeccable overall balance, the 2000 Franco is sublime. Like the Rupestris, the Franco is still a very young wine. Amazingly, these Barolos were very easy to source when they were first released. Today, the are virtually impossible to find. Flight two and we are drinking Monfortino and Granbussia? Yes. It is that kind of night. An epic wine, the 1990 Monfortino is breathtakingly beautiful. At nearly thirty years of age, the 1990 is remarkably fresh, perfumed and nuanced. Hints of iron, smoke and leather develop over time, but it is the wine’s soaring aromatic intensity and balance that elevate it to icon status. Aldo Conterno’s 1990 Barolo Riserva Granbussia, a wine from the estate’s glory days, more than lives up to its reputation. The Granbussia is darker and noticeably softer than the Monfortino, signs that Aldo Conterno long had a more modernist leaning than his brother, Giovanni Conterno, who made the 1990 at the family’s Giacomo Conterno estate. Both wines are a real pleasure to drink, not just taste. This flight is incredibly instructive, but also hits all the high notes on the pleasure scale. It’s been a number of years since I tasted the Brovia and Mascarello Monprivatos together. Brovia’s 1985 Barolo Monprivato is terrific, but this bottle doesn’t reach the extraordinary heights others have. No matter. All the sensuality and depth Monprivato is capable of comes through nicely. Naturally, at this stage, the 1985 is ready to drink, but it also has plenty of life ahead. The 1985 Mascarello Barolo Monprivato is absolutely stellar. Deep, powerful and also incredibly structured, Mascarello’s Monprivato is one of the most compelling wines of the vintage. If I didn't know better, I might have thought the wines in this pairing were inverted! The night reaches an extraordinary apex with Chef Nayfeld’s fabulous Wagyu Beef and Potato Purée. Seconds of potatoes? Yes, please. Bruno Giacosa’s 1960s wines are some of my favorite wines from anywhere in the world. In 1964, Giacosa made his first single-vineyard Barbaresco, the Santo Stefano Riserva Speciale, a wine that remains epic to this day. The 1964 Barbaresco Riserva Speciale is almost as moving. Silky, nuanced and subtle, the 1964 is pure and total class. It is truly remarkable to think that the 1964 has made it to the present day in such perfect shape. What a wine. The 1964 Barolo Riserva Speciale is even better. Here the breadth, power and muscle of Barolo come through loud and clear. While the Barbaresco says everything it has to say at the outset, the Barolo just keeps getting better and better in the glass. That, in and of itself, is truly remarkable. Some things are just meant to be. Our last pairing, two 1960s Mascarello Barolos, was the most profound of the night. 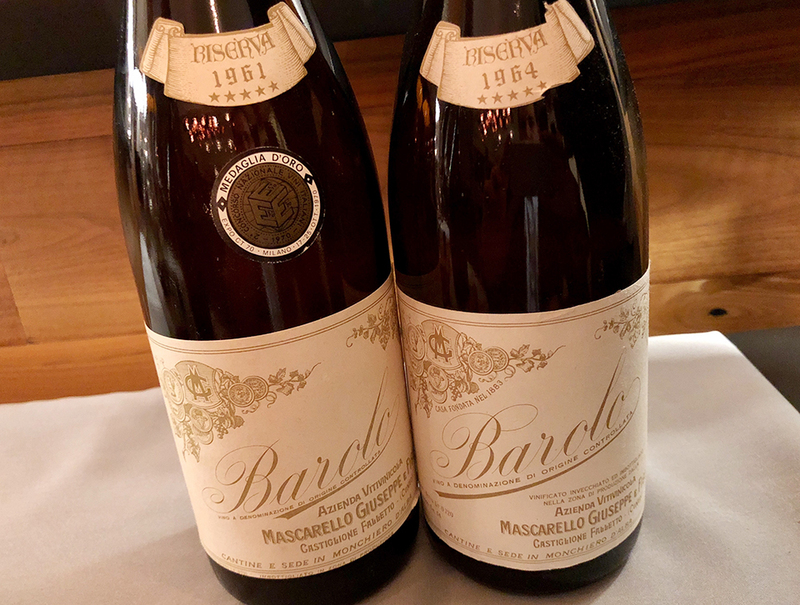 When Giuseppe Mascarello made these wines, the custom in Barolo was to blend fruit from different sites, a tradition that was born from the idea that sites with complementary attributes would make the best wines. Mascarello did not make their first single-vineyard Barolo until 1970. But we are getting ahead of ourselves. Mascarello’s 1961 Barolo Riserva is one of the greatest wines I have ever tasted. This bottle is simply stratospheric. Wow. I don’t know what else to say. Delicate and nuanced, with phenomenal balance and an eternal finish, the 1961 is as profound and as beautiful as wine can be. Some wines are good, other are outstanding and some are occasionally profound. Mascarello’s 1961 Barolo Riserva belongs to the next category – those rarified wines that are emotional. The 1964 Barolo Riserva is wonderfully translucent, gracious and also positively electric. There is a touch of volatile acidity in the aromatics that is hard to fully get past. On the palate, the 1964 is much more satisfying, with layers of exotically sweet, perfumed fruit and silky tannins that give the wine its considerable allure. The 1964 can’t match the 1961, but that would have been next to impossible. A bowl of white truffle ice cream is a wonderfully indulgent way to bring this fantastic evening of wine, food and friends to a rousing end.